What better way to serve fresh strawberries to your Sweetheart for any occasion? A perfect homemade treat to make for any super special day! This is my special treat for Valentine's Day but it doesn't have to be a holiday just make this one because it's awesome! In a large mixing bowl beat together the sugar, shortening, butter until fluffy. Add egg yolks one at a time beating after each one added. In another bowl add flour, salt. Add buttermilk and baking soda. Mix all together. Stir in the vanilla and coconut then chopped nuts. Beat egg whites until stiff in another mixing bowl until stiff. Gently fold into the batter. Pour into prepared pans. Bake at 350 until brown and middle springs back to the touch or use a toothpick method. Cool. 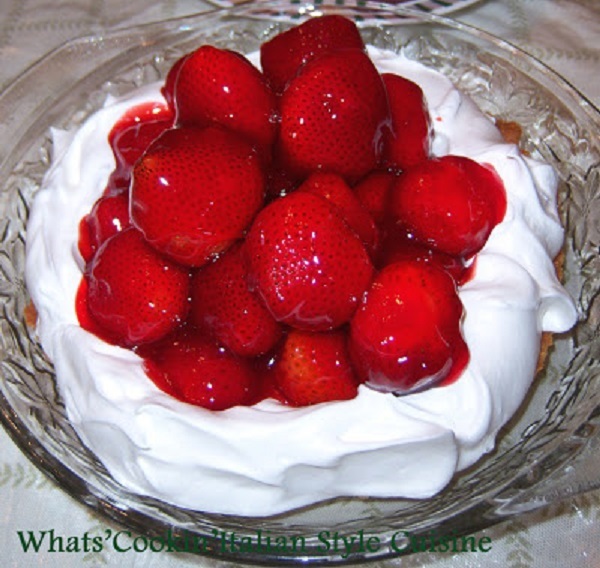 Spread cake layer or layers with whipped cream and mound Sstrawberries in the center to serve. Beat heavy cream with sugar, salt until stiff peaks. Refrigerate until ready to use on completely cooled cakes. Combine water, cornstarch, jello powder and corn syrup. Whisk to dissolve. Place on medium heat until the mixture thickens. Add food coloring if using. Set aside to cool. Add the strawberries to the cooled glaze and garnish cake. How pretty! A perfect V-day dessert! This sounds yummy. I will have to wait until spring to try as I want to use fresh berries not imported ones. I will bookmark this for when fresh strawberries are available again. In the interim, that cake recipe sounds delectable! Look out Valentine's Day. This one is perfect. I would like to save it when strawberries are in season in my area. What a yummylicious cake! I love the strawberries and whipped cream, but like the others, I'll have to wait for fresh strawberries. What a spectacular dessert! Perfect for a special occasion!